I have found Axiom Estates extremely professional and very customer oriented. The whole process of the purchase of the property was handled efficiently and with care. Good prices...modern amenities.And good location. Looking forward to it. 'Tower 9' of G+24 storeys launched and open for booking! Encompassed within the 100 acre Uniworld City, with breathtaking water and bridge feature, Unitech Fresco is undoubtedly a promising Kolkata property, in the heart of the upcoming CBD of New Town, Rajarhat. Offering spacious 3 BHK apartments over G+14 and G+24 towers, the complex also comes with an idyllic ambience for its residents. The spread of 9 acre magnificent landscaped greens offer a unique combination, merging premium lifestyle with nature's bliss in the centre of the proposed Central Business District. Featuring Indian lifestyle homes, designer landscaped walking tracks, gym and more this property is the ultimate choice for its residents. 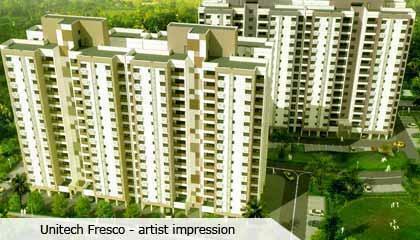 Located in New Town, Rajarhat, Unitech Fresco is surrounded by major schools, shopping malls and IT hubs. The NSCB International Airport is a 15 minute drive from the property and it is also close to DLF IT Park and Sector V.
Encompassed within the 100 acre Uniworld City Kolkata, Unitech Fresco is located in Action Area III of New Town Rajarhat, Kolkata. Popularly known as the Second IT hub of Kolkata, Rajarhat is also an impressive computer engineering hub. Moreover with the 6 - lane expressway connecting E.M Bypass and VIP Road, the property enjoys proximity to major educational institutions like the Delhi Public School and Techno India College as well as shopping malls like City Centre II. The N.S.C.B International Airport is a mere 15 minutes drive from the property and other landmarks like Sector V and DLF IT park are also close by. The proposed New Town - Howrah metro railway corridor and the TATA cancer hospital will also originate in the vicinity. 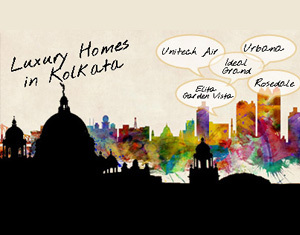 Unitech is the name behind some of the best developments in Gurgaon, Noida, Kolkata and many other cities in India. Today, the group has emerged as one of the largest developers and builders in the country, with several residential and commercial projects to its credit. Ranked among the top 50 Real Estate Companies in the world with ISO 9001:2000 Certification, they are one of the foremost developers in India with landmark developments like Nirvana Country, South City, The Close, the Cascade in Delhi and The Uniworld City in Kolkata to name a few.